AMC today announced the upcoming launch of a new movie-watching service that's designed to compete with MoviePass, allowing AMC customers to watch several movies per week for a monthly fee. While MoviePass permits customers to watch one movie per day for $9.95 per month, there have been questions about its long-term sustainability. AMC's "Stubs A-List" offering will let customers watch three movies per week for $19.95 plus tax, which it claims is a "sustainable price." MoviePass does not permit customers to watch more than one movie per day or to rewatch movies they've already seen once, both features that are included in the Stubs A-List program. Stubs A-List can be used at all AMC, AMC Dine-in, and AMC Classic theatres in the United States, with other perks that are not available through MoviePass. 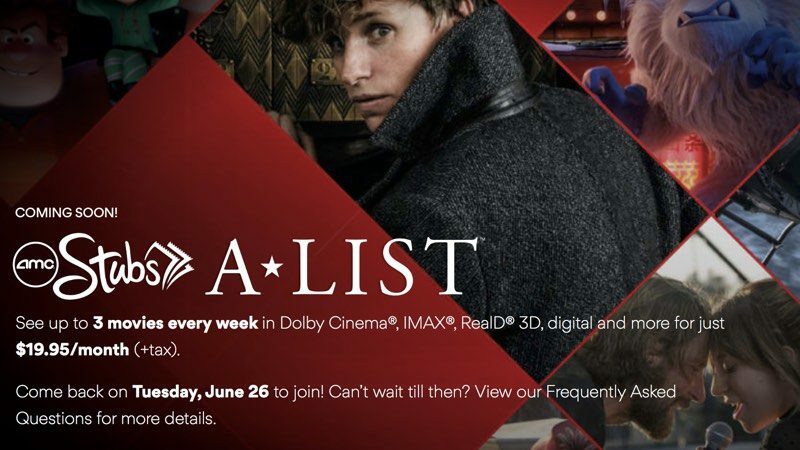 Customers can book tickets online in advance, including at AMC Theatres with reserved seating, and it includes IMAX, Dolby Cinema, RealD 3D, Prime, and Big D movies. Movie tickets can be purchased at AMC Theatres, on the AMC website, or through the AMC Theatres app, available for iOS and Android. AMC's new offering also includes all of the benefits of its AMC Stubs Premiere program, with "VIP service levels" at theatres, no online ticketing fees, and discounts on food and beverages, such as free upgrades on popcorn and soda. Stubs A-List will be available starting on Tuesday, June 26. This sounds great! If only there were movies worth seeing on a regular basis. When I was a teenager we had a similar program. It was called "Become friends with an AMC employee." The way it worked was you would buy a ticket with said employee on their day off early in the morning, and then you would go from theater to theater watching every movie showing during the day while the other employees looked the other way. We would do that about once a month or so. I saw nearly every movie in the theater that came out between 2001-2003. Lots of people did this and it was a great deal. Now that I'm an adult with young children I only get to go to the movies a few times per year so this is useless to me. Maybe someday. What I would prefer is a similar program for renting movies, along with that idea Apple was working on for being able to rent movies that are showing in theaters at a higher price. Netflix just doesn't cut it anymore. I'll still with Moviepass until it goes under. All of this nonsense is going to just drive up the single admission prices. Less than half the movies at twice the price?! Sign me up! That being said it is more convenient seeing as I don’t have to be near the theater to order my ticket, can reserve ahead of time and see IMAX/Dolby (which, sidenote, Dolby is AMAZING and everyone should watch movies in that format), etc. I think $14.99 is the way to go here now that there’s competition. This is just AMC's deathblow to put MoviePass out of business. Once MoviePass is gone, AMC will no longer offer this subscription and let people play out their last months of it....then it'll be back to business as usual. I don't doubt that this is AMC's response to moviepass and that they're planning on MP going out of business. But I also don't think they'll abandon it afterwards. A couple of interesting things I noticed on the website that weren't mentioned here... First, you have to "lock in" to a 3-month commitment. Also, you're "guaranteed" that your membership price won't increase for 12 months. Which leads me to believe that they plan on increasing pricing somewhere down the line... probably when moviepass is gone. Let's see if Regal comes out with something similar. Much more convenient for my location. Plus, I'm curious to see if this has an age restriction like MoviePass does. My 13-yo son would probably get WAY more use out of this (especially during the summer) than I would. Never heard of either of these services until today. But MoviePass seems very intriguing. I’ve been on MoviePass for 6 months now. Bought it back when it was an annual special. I’ve gotten my money back 5 times already. As someone who travels for a living I can’t always guarantee a specific chain availability so it’s not for me AMC. But heck even if MoviePass was unlimited at $20/m I’d still be in. I see 3-4 movies a week when the good ones are out. MoviePass until it dies for me. When it does, I’m back to $1.50 redbox. I’ll change my habits before I accept a price increase.